Every believer is responsible to conduct himself deliberately. To live deliberately is to live on purpose. It’s the opposite of letting life happen to you. It’s the opposite of going with the flow. To be deliberate is to be careful, not careless. To be thoughtful, not thoughtless. To be deliberate is to be intentional. I’ve been wanting to do a series on this topic for quite some time. But every time I consider starting, I’m reminded of all the objections to deliberate living. I’ve waited a long time in order to let my thoughts settle, but I’ll take this series similarly to how I handled my series on epistemology (part 1, 2, 3, 4, 5): I’ll work through it as I go. Another objection is that deliberate living is just a form of legalism. That it focuses on externals and insists on black and white answers. Finally, some would object that deliberate living is a professional concept, not a Christian one, and—as all good Piper fans know—brothers, we are not professionals. 1) To the first objection, I’d suggest that this logic simply doesn’t follow. Some people are more prone to honesty than others. But that neither makes honesty right or wrong. It’s immaterial. 2) In response to the second objection, certainly a legalist could easily gravitate to the conclusions of a deliberate mindset. But legalism is the exact opposite of deliberate living. To be deliberate is to let go of previous conclusions and to work through the issues in order to come to a deliberate conclusion. 3) Finally, I would posit that deliberate living is indeed a distinctly Christian concept. I would suggest that Christ perfectly exemplified deliberate living and that it is this deliberate, intentional work of Christ that lies at the heart of God’s saving grace to sinners. I hope to address these and other issues more thoroughly in coming posts. Having read this far, you might be thinking that my thesis (that every believer is responsible to conduct himself deliberately) is painfully obvious and pointedly dull. In fact, to put it plainly and probably more bluntly than wisdom would dictate, most believers don’t have the guts to do it. I do pray that you will. If you’ll allow me, I don’t think your point here is actually legitimate. Of course some things and areas in life should be deliberately planned and executed, but hardly everything. Whatever happened to spontaneity? Thanks for the input Taylah. I’ll have to think that through more thoroughly and hopefully address it in a future post. I suspect a fuller explanation of what I mean by “deliberate” would help as well. @Taylah, No. I’m glad to get feedback. Especially if it forces me to think things through more carefully. @RoSeZ, I didn’t mean it like that. If I came across that way, I’m sorry. That’s not what I intended to communicate. Oh, and “Mr. Harris” is my father. I have known Jason for a very long time and have never heard him use that stratagem. In fact I think people use it more about him than he does of others. I happen to be a very spur of the moment kind of person, and I agree that personality does play a role but I think deliberate living doesn’t rule out spontaneity. As with everything spontaneity has it’s place. I liked the bit at the top – that deliberate living is the opposite of letting life happen. Too often People (myself included) end up somewhere or doing something just because it was easy. @Jason: Thanks for the post! @taylah: Being effective requires being deliberate. One doesn’t finish High School or University or any long term task through spontaneity. It requires deliberate action and planning. One doesn’t maintain regular devotions, prayer and church activities by doing or attending them with spontaneity. If we don’t take deliberate action often times we take no action. So the question is therefore: Is there room for spontaneity? I believe there is. We should prayer when moved by a situation rather than think *It’s not time for my morning prayer yet..* for example. I don’t think all things require deliberation to the same extent, such as what we eat for breakfast and what we drink for lunch but factors are still involved. I mean after all if you want to lose weight one better cut down on drinking 4 liters of Coca Cola a day. What I listen to, who I spend time with, what I eat, what I drink, what I read, what I see and watch and do all impact me. As such we need to discern not necessarily from good and bad but more often than not from good and best. 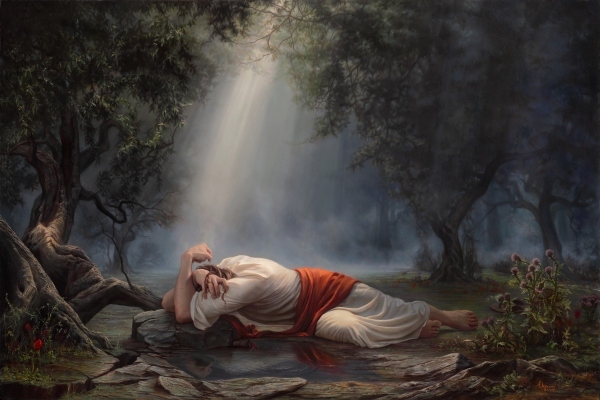 Who is the artist of the Agony in the Garden painting?